Happy glaucoma awareness month! That’s right, January is all about educating people about the signs, symptoms, diagnosis, and treatment of glaucoma. 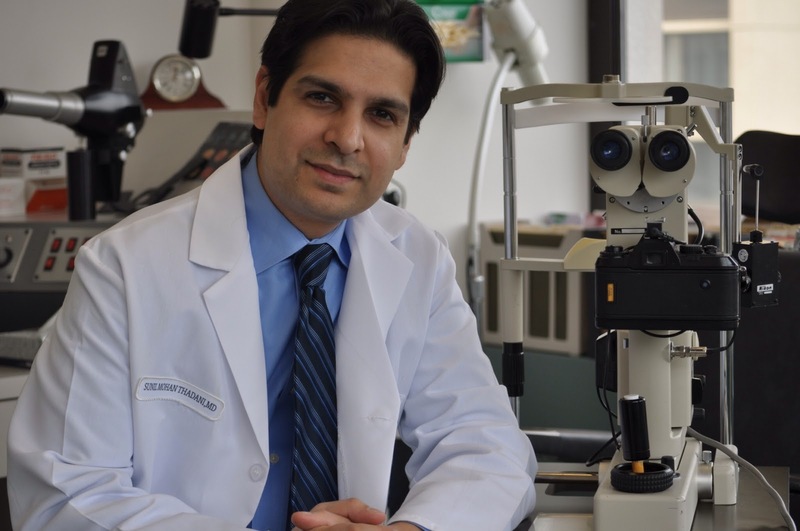 I chatted with Dr. Sunil Thadani, who was also interviewed in this article in the Herald-Mail, to answer some important questions about glaucoma. A: Glaucoma is a group of eye diseases that gradually cause patients to lose vision without warning; the vision loss is caused by damage to the optic nerve. It is the second leading cause of blindness in the world, according to the World Health Organization. There are two main types of glaucoma: primary open-angle glaucoma (POAG), and angle-closure glaucoma. Other types of glaucoma include secondary glaucoma, in which the eye pressure is elevated secondary to another disease process, and normal tension glaucoma where there is optic nerve damage and visual field loss in the setting of a normal eye pressure. Q: Are there certain people who are at a higher risk for glaucoma? A: Yes, high-risk groups include people over 60, family members of those already diagnosed, diabetics, and people who are severely nearsighted. Additional high-risk groups include those of African, Asian, and Hispanic descent. Although most common forms of glaucoma primarily affect the middle-aged and the elderly, glaucoma can affect people of all ages. A: In the most common form, there are virtually no symptoms. Vision loss begins with peripheral (side) vision, so if you have glaucoma, you may not notice anything until significant vision is lost. As much as 40% of vision can be lost without a person noticing. Q: So how do you diagnose glaucoma? A: A regular eye examination, including eye pressure measurement and an examination of the optic nerve, can help with the diagnosis. Additionally, a formal field of vision test can be performed if there is any suspicion of glaucoma. Early detection is vital to stopping the progress of the disease. Q: What are the treatment options? Can you cure glaucoma? Medications – in the form of eye drops. Finally, surgery to lower eye pressure can be considered if the pressure is unresponsive to medications and laser treatment. Q: What happens if glaucoma isn’t treated? A: Unfortunately, if glaucoma is left untreated, vision loss will occur and blindness is likely to result. With the current treatments, the outlook for many patients with early-diagnosed glaucoma is better than it has ever been. We have many approaches, including new laser treatments, to slow or halt the progression of vision loss. This can be best accomplished if it is caught early. The best way to protect your sight from glaucoma is to get a comprehensive eye examination. Then, if you have glaucoma, treatment can begin immediately.